Spring marks the beginning of the running season for many fitness enthusiasts who have been cooped up for the long, hard winter. This time of year, complaints from shin splints soar. 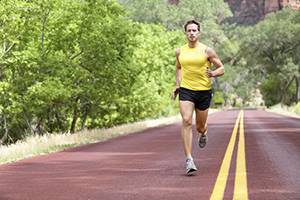 Shin splints are usually exercise-induced by over training or improper training. Repeated stress on the tibia (shinbone) and connective tissues results in soreness, pain, and inflammation. Shin splints can be a real nightmare for runners and cause a great deal of pain and discomfort. They can also be a nightmare for other athletes as well as the coaches and trainers who try to keep them in the game. Runners are more likely to get shin splints as they shift their workouts from the treadmill to the road, or when they begin to train for a race. Indoor exercises on the treadmill, stair master, elliptical machine, or stationary cycle are excellent for cardiovascular conditioning; however, they do not expose the legs and feet to the same impacts that occur on outdoor terrain. Many runners ramp up summer workouts too soon and find that they are more prone to get shin splints. It’s critical to allow your body to gradually adjust to the outdoor terrain. The general rule of thumb is not to exceed your distance and workout duration by more than 5–10 percent a week. It’s difficult to diagnose shin splints because the pain can mimic other problems such as growth plate inflammation, partial muscle tears, or tendonitis. Also, the origin of the pain can come from muscle imbalance, varying leg lengths, spine problems, nerve or artery entrapment syndrome, or compartment syndrome. Most people think there is only one kind of shin splints, but this is a misconception. There are actually three types of shin splints: medial tibial stress syndrome (MTSS), stress fractures, and compartment syndrome. The latter two may be very serious if left untreated. Posterior shin splints are the most common and account for approximately 75 percent of the cases. This is usually attributed to overpronation (excessive flattening of the foot) as it becomes load-bearing to the ground. Anterior shin sprints are typically present in both legs and especially common among runners at the onset of the season when they are exposed to uneven terrain. They are also present among athletes who play on hard surfaces, sports that require excessive starts and stops, and activities that involve jumping. Moderate pain is present at the beginning of exercise and tends to dissipate until the exercise is over. It may also become noticeable after waking up in the morning. The more advanced forms of shin splints are more difficult to diagnose. They can be related to stress fractures or compartment syndrome. Stress fractures are incomplete breaks in the bone that are usually caused by excessive stress on the bone. The bone micro-fractures develop when there is not ample time for recovery. Stress fractures usually cause severe pain and even nausea in some cases. Athletes who engage in high-intensity training are at increased risk. This includes runners who average more than 25 miles per week, participants in track and field, soccer, dance, tennis, and basketball. Females are also at higher risk than males. Females are three times more likely to have shin splints evolve into stress fractures. Compartment syndrome is the most serious type of shin splints. This condition occurs when pressure increases in a confined space, like a fascial compartment in the lower leg below the knee. During exercise, the muscle can swell. This condition is common among long distance runners and hill runners. Pain is quite severe with movement and persists when resting. If left untreated, it can have a damaging effect on the blood supply to the muscles in the affected compartment resulting in necrosis (death of the muscle). Other complications include permanent nerve damage, scarring resulting from surgery, infection, kidney failure, loss of limb, and in rare cases, death. It is critical that the condition be diagnosed quickly to relieve the pressure and to help facilitate recovery of the muscle. The prognosis for this condition depends on how quickly it is diagnosed and treated. Time is of the essence. Avoid shin splints this summer! Be smart about the way you approach your workouts. Proper footwear for a runner is a must; so is stretching and strength conditioning. If possible, run on softer surfaces and even grade. Use cold therapy with aspirin or ibuprofen to reduce swelling and pain. Consult with your physician if pain persists because the condition may be much more severe than expected and lead to serious problems if left untreated.